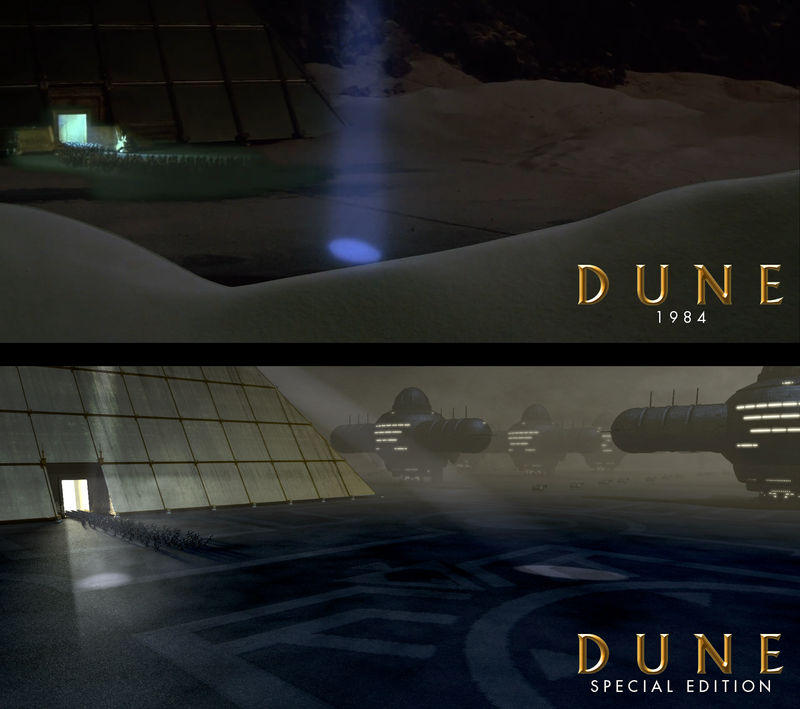 DUNE - Special Edition: Sardaukar prepare to defend their Emperor. 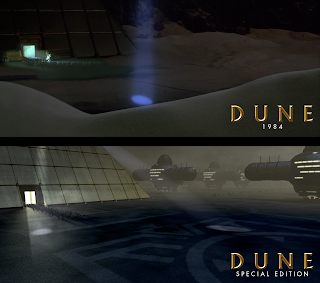 Here is a work-in-progress of a new version of the shot where the Sardaukar rush forth from the Emperor's steel tent and prepare to engage the approaching Fremen. The original shot seems almost as if it was a last minute rush job - It doesn't look like one of the many clever Emilio Ruiz del Rio shots (Whereby a miniature was filmed on a high platform to carefully match live action filmed at the same time.). This looks like a miniature was was filmed and then the Sardaukar were composited onto it later - but that the live action portion didn't have enough lighting on it, leading to the Sardaukar becoming a dark blob in the center of the frame. This is exacerbated by the greenish tint to the live action which doesn't match the surrounding miniature. The searchlights have been added in post as well and don't seem to really be coming from where the Emperor's ship would be positioned at the top of the tent. "He swung the telescope to the far side of the Arrakeen landing field now, to the Harkonnen frigates lined up there with a CHOAM company banner waving gently from its staff on the ground beneath them..."
Right now, the Sardaukar are temporary models and they are not yet moving quite right. I will probably have more of them coming forth as well as the Steel Tent contains 5 Legions of them (Per the book). From WIKIPEDIA: "A typical legion of this period had 5,120 legionaries as well as a large number of camp followers, servants and slaves. Legions could contain as many as 6,000 fighting men when including the auxiliaries, although much later in Roman history the number was reduced to 1,040 to allow for greater mobility." So the Emperor could have as many as 30,000 men or as few as 5,200. Going with the typical number of 5120 per legion that would mean 25,600 Sardaukar are in this structure. However in the film the Emperor states. "I want 50 legion of Sardaukar on Arrakis at once!". He obviously doesn't bring them all down with him! Any chance for a 2018 update?